This film follows two young women who have run away from the academy, Lissa (Lucy Fry), a magical vampire princess, and Rose (Zoey Deutch), her half vampire guardian. They are captured and returned to the academy to protect them from the Strigoi, powerful vampires who’ve turned to evil. Once there, teenaged vampires are revealed to participate in the same drama that human teens do. 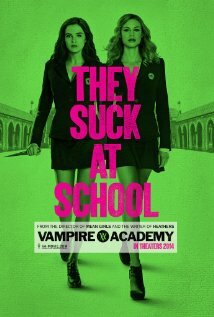 Lissa uses her magic to manipulate the other vampires while Rose is trained by Dimitri, one of the school’s adult guardians, and a plot against Lissa is slowly revealed. This vampire high school story tries to be like Harry Potter, but falls a long way short. The acting is decent, but the writing is a bit too adolescent, and the adaptation for the screen is weak in places. The romantic plot lines are predictable, the rest of the story a bit rushed. I haven’t read the young adult novel the film is based on. After this film, I doubt the sequels will be brought to the screen. This entry was posted in movies and tagged lucy fry, movie, review, strigoi, vampire academy, vampires, zoey deutch. Bookmark the permalink.